Some highly damaging pathogens of common deciduous trees in New York State are most easily diagnosed when the organism is sporulating or actively growing, when symptoms have recently developed, or when the level of the organism in the tissue is high enough to be detected using an ELISA test. For the most reliable results, please try to submit living tissue at the best diagnostic times. For New York State, the table below may be a helpful reminder of when to look for symptoms and when to submit tissue. 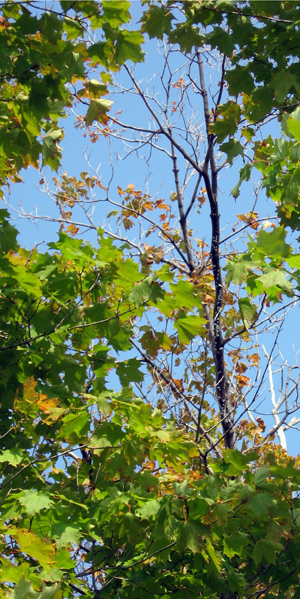 Hosts Maples are the most common host, but many trees and shrubs are susceptible. Symptoms Small leaves may be observed by the time leaf size is fully developed, but premature discoloration may not develop until later. Tissue to Submit Small living branch segments 1/4 to 2 inches in diameter and 4-12 inches long. Timing Timing: Collect from symptomatic branches as soon as symptoms are noted. Symptoms Off-color foliage may be noted mid-summer and will eventually wilt and die. Tissue to Submit Same as for Verticillium. Timing Collect tissue when symptoms first observed and before foliage on affected branches is fully dead. Hosts Oak: The red oak group may be more susceptible than the white oak group. Symptoms Usually scorching of leaves develops after leaves fully mature and when temperatures get hot in July and August. Timing Infected trees may die in the same season symptoms develop so be certain to get fresh tissue submitted as quickly as possible after symptoms are observed. Hosts Various: Maple, Oak, Sycamore, Elm, and potentially many others may be infected. 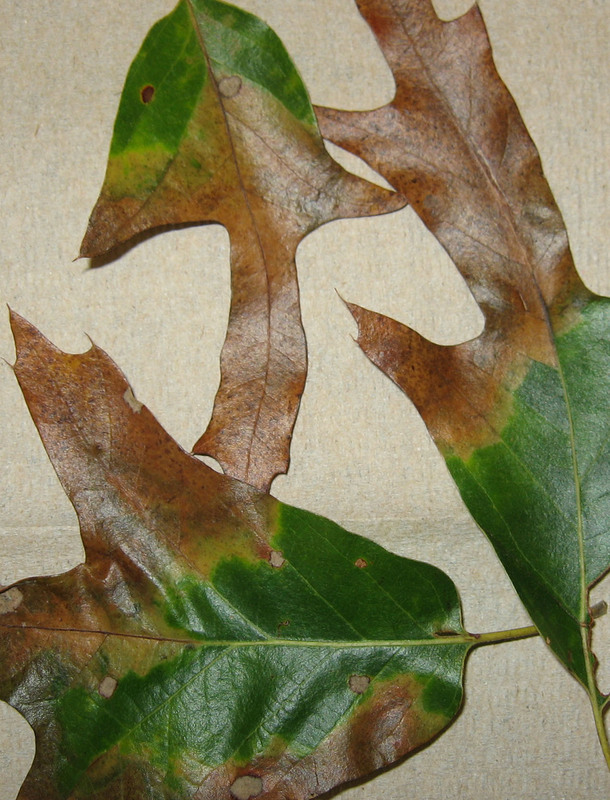 Symptoms On oak, symptoms may be similar to Oak Wilt making lab analysis important for identification. For other hosts look for leaf scorch with a bright yellow band between green and scorched leaf tissue. Tissue to Submit Leaf petioles are used for analysis so be certain to collect sufficient symptomatic leaves for testing. Larger petioles: about 25 leaves Small petioles: about 40-50 leaves. Very thin and/or very short petioles: 50-100 leaves. Timing In the Northeastern U.S. wait until September-to early November to collect tissue as the titer of the organism may be high enough for detection via ELISA at that time. Please keep in mind that for all of these pathogens, freshly collected tissue and overnight shipment is best, but for OW, overnight shipment may be imperative. During hot weather, it may be best to submit tissue in a cooler along with an ice pack. For VW or DED timing is a little less critical, but any shipment that may be in transit for more than 2-3 days may become overheated or start to dry out and may no longer be suitable for culturing when it is received. Leaf tissue for BLS testing is hardier, but please keep foliage dry for shipping. or more information on these diseases, you may find many, many on-line fact sheets. Below we have included links to some of the US Forest Service fact sheets on these diseases. Diagnostic review reports and the latest lab updates delivered directly to you. Learn how!